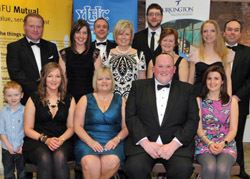 The YFCU’s arts festival gala evening recently took place in the Millennium Forum, Londonderry. The gala evening is the pinnalce of the association's arts festival which has been sponsored for a number of years by NFU Mutual Insurance Society Limited. Seventeen clubs took to the stage in venues around Northern Ireland to perform a short drama piece which the members wrote and produced themselves. Each evening the performances were judged by independent adjudicators who looked at the content, presentation, technical competence, audience appeal and general effect. The top five clubs, Coleraine YFC, Glarryford YFC, Kilraughts YFC, Moneymore YFC and Finvoy YFC then made it through to perform at the arts festival gala evening on Saturday 20th March 2010 at the Millennium Forum, Londonderry. Patricia Lewsley, NI Commissioner for Children and Young People was the special guest speaker at the gala. The VIP reception was sponsored by Turkington Livestock Systems who kindly provided the refreshments prior to the show and during the interval. The evening was a great success and enjoyed by all members, their families and the VIP guests. Check out the website's gallery to see pics of the night. FESTIVAL FEVER…Deputy President of the Young Farmers’ Clubs of Ulster William Wilson joins special guest Patricia Lewsley, NI Commissioner for Children and Young People with the arts festival producers at the VIP reception at the association’s annual arts festival gala evening that took place in the Millennium Forum.